WASHINGTON (AP) — Michelle Obama will lead the U.S. delegation to the opening ceremonies for the 2012 Summer Olympic Games in London, the White House said Tuesday. It has become a tradition for first ladies to lead the U.S. delegation. Laura Bush headed the delegation to the 2006 Winter Olympics in Torino, Italy, and Hillary Rodham Clinton led the delegation at the 1994 Winter Olympics in Lillehammer, Norway. 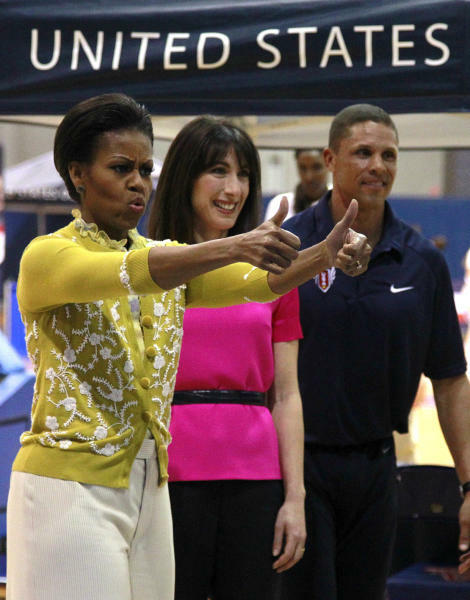 In advance of the upcoming summer games, Mrs. Obama hosted a mini-Olympic competition with physical activities for D.C.-area children at American University on Tuesday. The competition is part of her Let's Move! initiative to promote fitness and healthy eating. Olympians and Paralympians including Kortney Clemons, Dominique Dawes, April Holmes, Lisa Leslie, Lori Ann Lindsey, Dan O'Brien, Becky Sauerbrunn and David Wagner led the children in competitions that included basketball, soccer, tennis and relay races. The fifth-graders were from MacFarland Middle School in Washington, Manor View Elementary School in Maryland and Arlington Science Focus School in Virginia. Mrs. Obama was joined by Britain's first lady, Samantha Cameron, who is accompanying her husband, British Prime Minister David Cameron, on an official two-day, visit to the U.S. The first lady and President Barack Obama will host the Camerons at the White House for a state dinner on Wednesday. 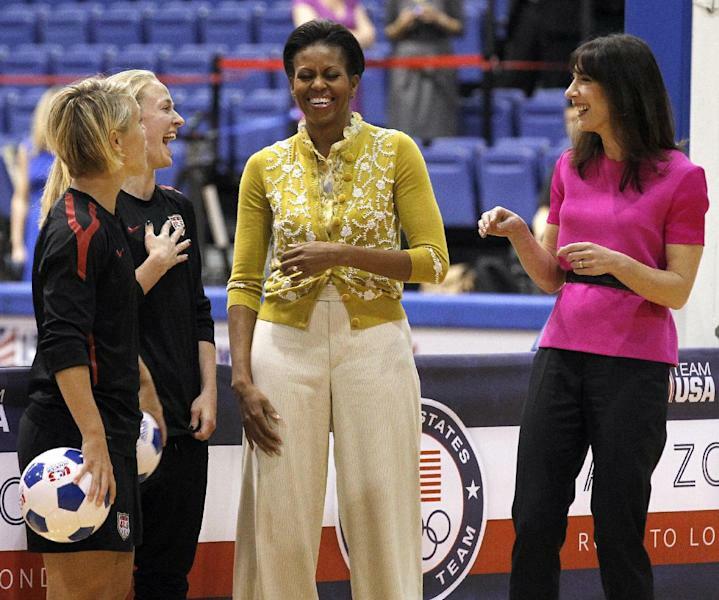 The two first ladies stopped by about halfway through the students' hour-long workout. 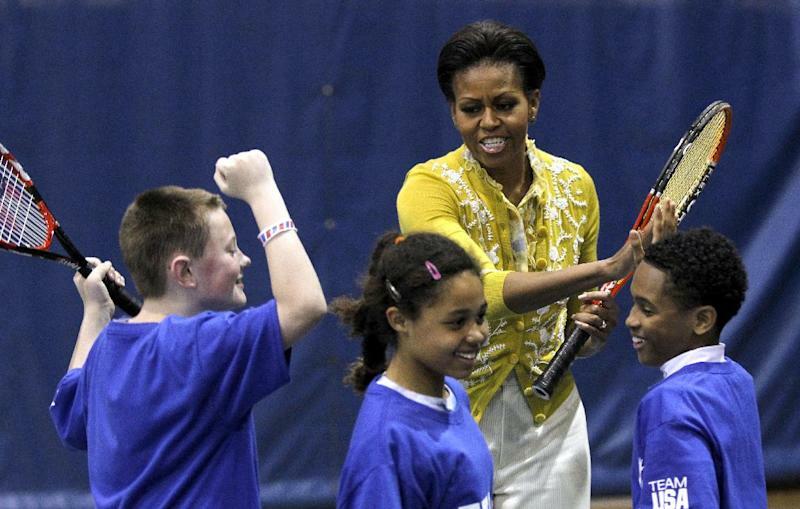 They mostly observed, but Mrs. Obama briefly hit tennis balls with the kids before making a few remarks. She told the children she was thrilled about leading the U.S. delegation in London. "It's not just about who wins the medals, or which country wins the most medals," Mrs. Obama said. "That's not what the Olympics are about. Instead, the Olympic Games are about commitment, about determination, and, most importantly, it's about teamwork." She said she hopes the Olympics and athletes inspire young people to get up and move. The mini-Olympics concluded with an award ceremony, with the athletes placing medals on the students.